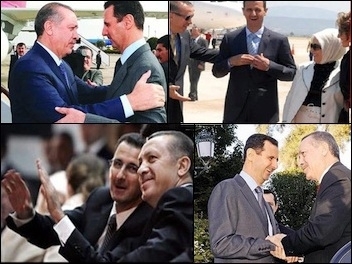 Six years ago, Syrian President Bashar al-Assad was the darling of Turkish President Recep Tayyip Erdogan. Six years ago, Turkey's official narrative over its leaders' Kodak-moment exchanges of pleasantries with Syrian President Bashar al-Assad's regime in Damascus promised the creation of a Muslim bloc resembling the European Union. Border controls would disappear, trade would flourish, armies would carry out joint exercises, and Turks and Syrians on both sides of the border would live happily ever after. Instead, six years later, blood is flowing on both sides of the 900-kilometer border. Inside Turkey, clashes between security forces and members of the youth wing of the outlawed Kurdistan Workers' Party (PKK) have been taking place for weeks. Many towns and neighborhoods have turned into ghost towns, as strict curfews are now in place. As a result, tens of thousands of Kurds have been forced to flee their homes, seeking refuge in safer parts of the country. While the Turkish army struggles to diffuse the latest Kurdish urban rebellion, hundreds of Kurdish militants and members of Turkey's security forces have lost their lives. Already in Istanbul, violence erupted on February 2, 2016, when unidentified gunmen opened fire on the campus of an Islamic association; they killed one man and wounded three others. In a second incident in a suburb of Istanbul, two people were killed and seven wounded after armed assailants fired on a teahouse. Turkey fears the Syrian Kurdish fight against IS could earn the PYD international legitimacy. On February 1, Brett McGurk, the U.S. envoy to the coalition against IS, visited a part of Kurdish-controlled northern Syria. 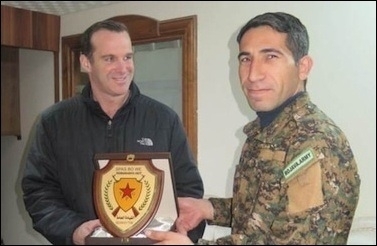 On his visit, McGurk posed in front of cameras with a PYD commander -- all smiles -- while receiving an honorary plaque. The ceremony lent further legitimacy to the PYD. Brett McGurk, the U.S. envoy to the coalition against IS, with a PYD commander on February 1. McGurk's actions greatly angered Turkish President Recep Tayyip Erdogan. In a statement directed towards Washington, Erdogan asked: "How will we trust [you]? Am I your partner or are the terrorists in Kobane [the Kurdish town in northern Syria]?" Erdogan is paying the price for his miscalculated aspiration to install a Sunni Islamist regime in Syria. With the Middle East ravaged by religious radicalism and sectarianism, the European Union and the United States can't afford the Turkish government's brutal military efforts against the Kurds or its undemocratic war on academics and journalists. Only a secular, democratic Turkey that can provide a regional bulwark against radical groups will bring stability to both the Middle East and Europe. As Mr. Erdogan seeks to eliminate all opposition and create a single-party regime, the European Union and the United States must cease their policy of appeasement and ineffectual disapproval and frankly inform him that this is a dead end.